^ BirdLife International (2012年). "Traversia lyalli". IUCN Red List of Threatened Species. Version 2013.2. International Union for Conservation of Nature. Retrieved 26 November 2013. ^ Rothschild, Walter (1894): A new species from Stephens Island. Bull. B. O. C. 4(22): 10. ^ Rothschild, Walter (1895): Notes on Xenicus lyalli. Ibis 7(1): 268-269. ^ a b c Medway, D.G. 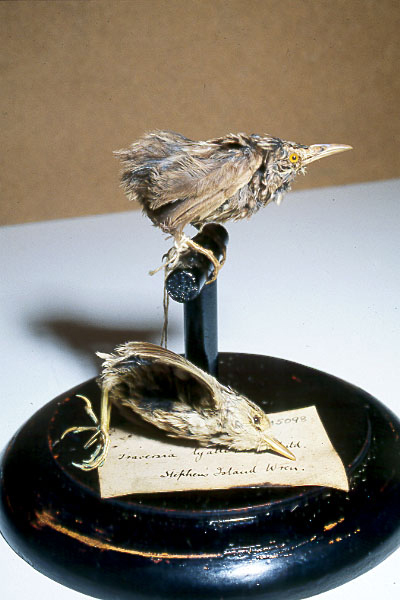 (2004) The land bird fauna of Stephens Island, New Zealand in the early 1890s, and the cause of its demise. Notornis, 51:201-211. ^ C.W.ペリンズ, A.L.A.ミドルトン編　『動物大百科9　鳥類III』　平凡社　1986 ISBN 4-582-54509-2 p30. ^ Millener, P.R. (1989) The only flightless passerine: the Stephens Island Wren (Traversia lyalli: Acanthisittidae). Notornis 36(4): 280–284. ^ Rothschild, W. (1905) "On extinct and vanishing birds." Proceedings of the 4th International Ornithological Congress, London: 191–217.